Politics & Gender is an agenda-setting journal that publishes the highest quality scholarship on gender and politics and on women and politics. It aims to represent the full range of questions, issues, and approaches on gender and women across the major subfields of political science, including comparative politics, international relations, political theory, and U.S. politics. 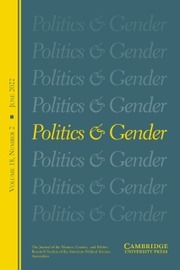 The Editor welcomes studies that address fundamental questions in politics and political science from the perspective of gender difference, as well as those that interrogate and challenge standard analytical categories and conventional methodologies.Members of the Women and Politics Research Section of the American Political Science Association receive the journal as a benefit of membership. Do Women Favor Foreign Direct Investment?